This past Wednesday, we got to see the baby again. It was time for another sonogram and everything is looking great. 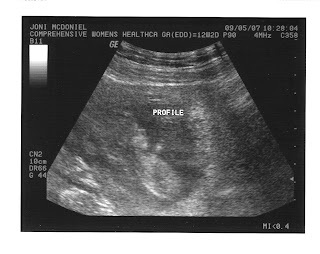 I think the sonogram has got to be one of the most amazing experiences that technology has to offer. And, I still say that anyone who can look at a sonogram and not see the incredible creativity, power, wonder, etc of God is missing the big picture. Like I said, the baby is doing great. We laughed when the technician said that it appeared that the baby was ahead of schedule by several days. Joni's family has a history of birthing big babies, so we assumed it was no different with her. Joni is also feeling much better now that she is entering her second trimester. We leave for Walt Disney World in less than 2 weeks for Disney's EarMarked Conference for Authorized Disney Vacation Planner travel agencies. After the conference, we are spending another week just hanging out and enjoying the parks. We are very excited!